Paul and Sarah Manhart—the world’s only husband and wife cryptozoology team—are back in action with their third thrilling adventure. An old Tibetan monk has presented them with an unusual gift: a claw from a type of pterosaur Paul identifies to have lived during the time of the dinosaurs. The problem is that the claw is less than sixty years old, enticing them to embark on an expedition to the “rooftop of the world” to see whether others of its kind still roam the rarified air of Tibet. Only they hadn’t bargained on getting caught up in a treacherous game of cat and mouse between the Chinese Army and winged creatures that are as vicious as they are terrifying. They are forced to not only fend off creatures capable of killing with a single snap of their jaws, but also opportunistic Chinese Army officers who are intent on seeing them dead so that they can cover up their own nefarious deeds. Fortunately, they find an unlikely ally in the guise of a surly and ruthless colonel named Deng, the only man capable of providing them a slim chance at survival—if they aren’t already too late. Now shipping! 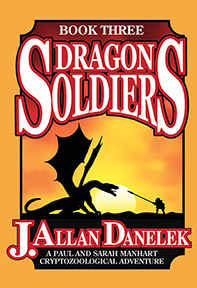 DRAGON SOLDIERS: A Paul and Sarah Manhart Cryptozoological Adventure—Book 3 By J. Allen Danelek. 459 pages. 5x8 Paperback. Illustrated. References.